Hotel reservations for the 2018 NYSABE Annual Conference are now being accepted. 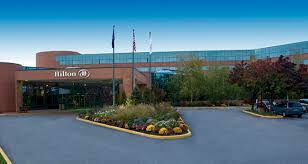 The NYSABE Conference special rate is $149.00 per room per night. This special conference rate will be available through February 23, 2018. Call 631-845-1000 and make reference to the 2018 NYSABE Conference or BILEDU. The hotel reservation process will require you to submit a credit card number to hold your room. Hotel Purchase Orders can also be faxed to 631-577-1501. Take the Long Island Rail Road to the FARMINGDALE STATION. WE STRONGLY RECOMMEND NOT TO TAKE A CAB DIRECTLY FROM THE AIRPORT TO THE HOTEL. Those rates are very expensive. Instead, get into the Long Island Rail Road and to Farmingdale Station and then call the Hotel Shuttle or a cab from that Station (see information By Train above).